October 10. 2015 - Luino, Italy - Changing the hierarchies in Luino where exploiting the Inverna between 5 and 12 knots - southerly wind typical on Lago Maggiore - the Coppa Lino Favini, event valid as the final act of ​​Audi tron Sailing Series Melges 24 and Melges 24 European Sailing Series, came alive with the completion of three more races. After five races the leader of the provisional ranking is Maidollis ITA822 (Fracassoli-Bianchi, 1-2-3 today) by Gianluca Perego, who took advantage of the bad day lived by the leader of the first hour Blu Moon SUI825 (Favini-Sommariva, 8-13-6), for overtake it along with Audi Italia Sailing Team’s Audi tron ​​ITA840 (Simoneschi-Benussi, 12-1-1), now certain of the success in the Audi tron Melges 24 Sailing Series. Blu Moon, leader of the special classification valid for the award of the Melges 24 Open Swiss Championship, is now delayed by six points compared to Audi tron ​​and is chased by the Austrians Michael Schineis’ Pure AUT716 (Schineis-Cassinari, 2-3-14) by a single length. 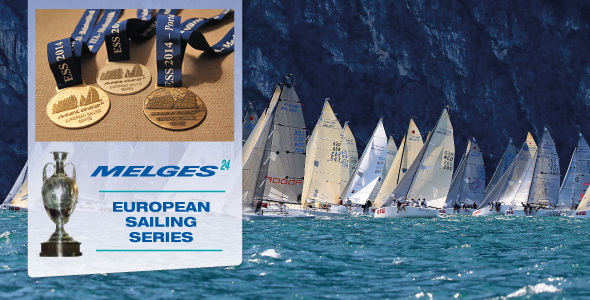 Clutching the provisional top five are the Hungarians on FGF Sailing Team HUN728 (Bakoczy-Rosznyay, 4-9-10), on the second position in the Melges 24 European Sailing Series behind Miles Quinton’s Gill Race Team GBR694 (Carveth-Quinton, 5-15-13), which appeared a bit in trouble today. Talking about the Corinthians the leader are the Swiss Christopher Renker’s RCO SUI731(6-10-12) while Oleg Dyvinets’ Marusia UKR819 (Dyvinets-Dyvinets, 13-18-21), who leads the standings for the Melges 24 European Sailing Series, struggling to get out from the back.